A Godly Play story (followed by a period of wondering) is just part of what is called Godly Play. Often the longest part of our session is response time, also called work time. Between entering Godly Play’s sacred space and departing with a blessing, the whole of Godly Play offers a special time and place to meet, be with, and yes, play with God! During response time when everyone is free to choose the playful work that he or she needs to do – today, and all have good, accessible, and managable tools …road blocks and distractions found in an often noisy and hurried secular life are removed. We have glimpses into something larger and beyond ourselves, and in the process of this “big work” (deep play), growth happens! 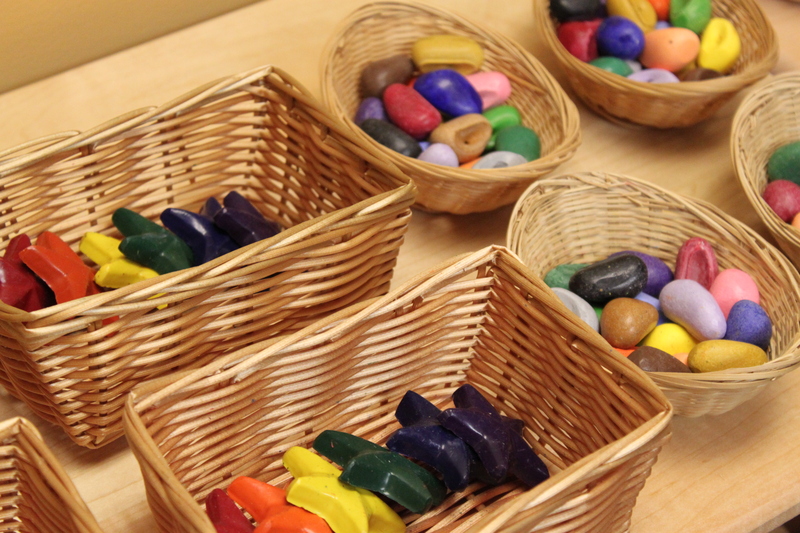 Similar to a Montessori classroom’s prepared environment, our room is carefully set up with what children need to support them in this process. Workrugs help frame one’s work and keep essential parts together. Each story has an appropriately sized tray or container so it can be successfully carried by a child, unaided, from the shelf to work space on the floor. There are the things children need to take care of the room. This room is even prepared for nonwriters to put their names on art projects, without needing help! To all of our children: This room is for YOU!